Amazing stuff! Helps with everything I need it for! Just bought my second bottle 🙂 , still feels good as the first time I took it. I have taken other brain focus products, this seems to have the edge most lack. I don’t feel drained afterwards either, good stuff! I had this recommended by my co worker, and yes it has done me wonders! Good product, definitely feel an improvement in my focus and energy. Works amazing especially with NO CAFFEINE. Fast shipping, and it works great! Feel really good after my first day! Wow Love Love Love Love This !!! Amazing! Thanks! 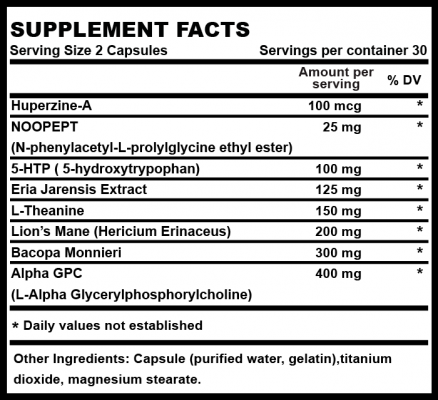 Perfect supplement, I liked the way it made me feel more clear. Buying again for sure. As an athlete brainova has helped me get the edge I need. I recommend to anyone looking for a legit product. My 2 months post review, I love brainova it has done wonders. No other product is like it, I have tried alot of brain supplements. This has taken me to the next level without any crashes or side effects. Thank!! Works excellent, I take it in the morning and by 3pm. 2 pills twice a day. I am on my A game for sure!! Super focused and in tune with my surroundings. Brainova works great. I bought another bottle. My whole staff swears by it. Most people quit drinking coffee and just takes brainova daily.